Electricity is part of every aspect of our lives. From the minute we wake to the radio of our alarm clock, to plugging in our phone to charge it for the day ahead, the popping sound of the toaster bringing us hot breakfast as we catch up with the breaking news on TV, electricity forms a major part of everything we do, day and night. It can be taken for granted though – the invisible current powering the items we own, the way we light our homes and the access it gives us to the world around us. Electricity is invisible – but powerful. Whilst we may just switch on lights and only think about the electric if the bulb blows or in times of a power cut, it needs to be maintained so it’s safe for everyone to use. Electric circuits which are old or poorly repaired can be very dangerous and appliances which haven’t been repaired correctly can lead to risks of shocks or fires. It’s time then to check out how safe the electrics in our home are with this guide – and to take action if there’s anything that you feel is ringing alarm bells. Whilst electrical safety is important in all areas of the home, those which may have water or condensation involved – the kitchen and the bathroom – need particular care and consideration. With over 50% of accidental home fires starting in the kitchen, the figures show that the majority were caused by electrical appliances such as cookers or microwaves. Other causes include problems such electricity and water coming into contact with one another, poor installation of cabling and too much heat. Water and electricity just don’t mix. It’s a dangerous and potentially fatal combination, but there’s always going to be water in a kitchen whether it’s flowing from a tap, cooking the vegetables or condensation from boiling liquids. To stop accidents, sockets must be a safe distance away from the sink; at least 30cm is recommended for this part of the kitchen. The other area of the home where there’s always a mix of water and electricity is the bathroom. With a wet body from the bath or shower lowering your resistance to an electric shock, this is an area where extra care is needed. As there’s the extra element of safety needed with electrical wiring in the bathroom, many jobs need a qualified electrician. Always talk to someone with the right skills if you need any work carrying out rather than trying the job yourself. Unless it’s a shaver socket or a standard socket which is mounted more than 3 metres away from a bath or shower, sockets are not allowed anywhere in the bathroom. This may sometimes feel inconvenient – when wanting to use a hairdryer perhaps, but it’s vital to stop water and electric mixing. 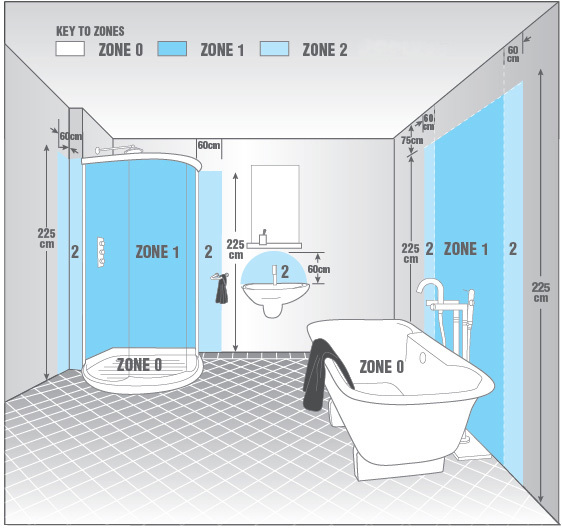 Allowed shaver points have to be mounted well away from the bath or shower in case of splashes. If you want to update the look of the bathroom and new lighting is the way forward, choose enclosed fittings rather than those which hang directly down. That way condensation from steam can’t enter the wiring. A pull cord for the light is the safest option rather than a switch. You may think that your wet hand and an enclosed wall mounted light switch won’t be a problem, but there’s every chance it could be. If it’s cold in your bathroom, an electric heater must be permanently wired and fixed. Never bring in a portable heater. Wherever there’s a need to carry out a job in the home, you need to know exactly what you’re tackling otherwise you or your family could be at risk of injury. Repairs or additions involving electricity need even more skill and experience and it’s often best to call in a qualified electrician rather than ‘have a go’. The most important advice is not to ignore small problems with anything electricity related; a slightly damaged cable, a loose socket, the slight smell of burning when you turn on an appliance. Many electrical repair jobs in the home can be quickly fixed by someone in the trade and it makes sense to tackle small jobs now before they become a major safety issue. Electricity may be invisible, but it’s something you always need to be aware of. If you have any concerns or questions about the electrical circuits and appliances in your kitchen or bathroom, feel free to Contact Me today.